There are five minutes left in the grand final. The Western Bulldogs lead by nine points. Josh Kennedy, the Bulldogs’ tormentor all day, delivers an impossibly quick no-look handball into the path of Lance Franklin, whose momentum in the game is building. Buddy wheels around onto his left – a sentence and an image that has been a preface to heartache for so many teams over the years – and looks to burst through the centre square and drive the Swans forward again. But before he can unload, Dale Morris, the man with a broken back, brings him down from behind. Holding the ball. The ball spills, and Tom Boyd, so often a figure burdened by expectation but today impelled by it, decides not to wait but instead to win the grand final. He booms a kick from inside the centre square and the ball bounces towards the left of the goalmouth. It’s a kick that normally continues on its trajectory left and trickles through for a behind. But, like the ball that Stephen Milne is still watching, it takes an unlikely turn right, going through the goal as if the collective will of a nation was pursing its lips and blowing it through. The Bulldogs win the premiership. Bulldogs fans, football fans, and the neutrals caught up in the cinema of it all are left to ponder a single question: Is this real life? And the answer is no. It’s something better. Sixty-two years of history led up to Morris’s tackle, Boyd’s kick and the Bulldogs’ bounce. Sixty-two years of misery told every Bulldogs fan that the ball was going to bounce left. For so long, failure was a desert, and hope was a series of poisoned oases. Whether they were the Footscray Football Club or the Western Bulldogs it didn’t matter – for more than half a century the team’s lone identity was failure. After losing the 1961 grand final, from 1962 to 1996 the Dogs won as many wooden spoons as they did finals: two. The late 90s produced the most successful Bulldogs teams since the early 50s, but all that meant was seven finals – only two of them victories. Of the five losses, the two most crippling both came against Adelaide in the ’97 and ’98 preliminary finals, the former, a two-point defeat, coming to symbolise the Bulldogs’ misfortune. That team, led by Terry Wallace and full of so many players that Bulldogs fans still hold dear to their hearts – Chris Grant, Tony Liberatore, Scott West, Scott Wynd, Rohan Smith and Brad Johnson – faded away innocuously like the half-century of Bulldogs teams before them. And really, ‘innocuous’ is the word that came to define the Dogs. Along with the Saints, they were every Victorian’s second club, and the adoption of a second club is always the greatest insult you can heave at them. The Dogs were toothless, a punch line to most, cute puppies to nurse and tease, bearing little resemblance to the fearsome animals from which they took their moniker. A poor club with few members, the Dogs had to demean themselves to stay afloat. They played ‘home’ games that defied geography in Darwin, and most memorably against Sydney in Canberra. The Bulldogs struggled to take the field and when they did they struggled even more – they were the teenager who has to ask his parents for lunch money and then gets it stolen the moment he steps outside. And more than anything, the Bulldogs lost. They lost games, seasons and players, they lost the competition’s respect, and more than anything, they lost hope. Losing was a terminal disease, a vicious cycle perpetuated by poor management, poor facilities and poor drafting (top ten picks at the start of the 2000s were wasted on the likes of Jordan McMahon, Sam Power, Tim Walsh and Tom Williams). Between 1963 and 2005 they produced just 13 seasons with more wins than losses. When a culture of losing runs so deep in a club it becomes more than expectation – it crosses into inevitability. Along with the Saints, they were every Victorian’s second club, and the adoption of a second club is always the greatest insult you can heave at them. Why did Tony Liberatore’s match-sealing goal get called a behind in the ’97 preliminary final? Why did Chris Grant poll the most votes in the Brownlow medal that same year when he was ineligible? The same simple reason: because bad things happen to the Bulldogs. When Rodney Eade came on board in 2005, a scent of hope came with him. 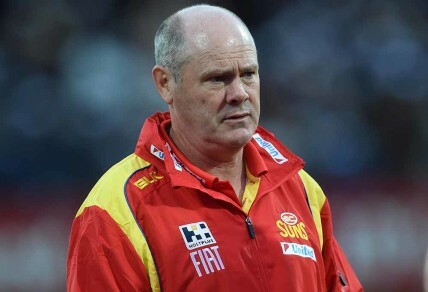 Eade never won a premiership at Sydney, but he took them to a grand final, and into September in five of his seven seasons there. In a similar vein to Mick Malthouse arriving at Collingwood in 1999, Eade brought with him a credibility that the Bulldogs had long lacked. Fortunes immediately turned. The Dogs improved by six wins in Eade’s first year at the helm. The next year they won their first final since 1998, demolishing the favoured Magpies in front of 84,000 people, and allowing Rohan Smith a chance to play a 300th game the following week, his last. They lost that game in Perth to the eventual premiers West Coast, but they’d already exceeded expectations. If they’d ever been ‘there’ in the first place, after 2006 you could have said that the Dogs were ‘back’. Injuries led to a lost year in 2007, but 2008 saw the Bulldogs finally rise back into contention for the first time in a decade. They had a core that had grown ripe, a depth in quality players, names like Adam Cooney, Ryan Griffen, Matthew Boyd, Dale Morris, Shaun Higgins, Will Minson, Robert Murphy, Brad Johnson, Brian Lake and Daniel Cross. There were no superstars – as much as a medal around Cooney’s neck might have suggested otherwise – but the Dogs were deep in talent and played a free-flowing attacking style that was easy on the eye. When they were on, they were ON, blitzing teams with quick ball movement and sharp foot skills. The problem was they could never find that on switch in preliminary finals. Former Bulldogs coach Rodney Eade. They fell short in the penultimate week of the season in ’08, ’09 and ’10, never able to clear the proverbial hump. A hump that hadn’t been cleared since 1961, and with each finals loss grew more and more imposing. Perhaps the greatest tragedy of those three consecutive preliminary final losses is that the Bulldogs had no excuses. There wasn’t some catastrophic injury they could point to or any controversial umpiring decision. There was no sign that fate was conspiring against them. They just weren’t good enough. Lament is often a warm blanket for fans to tuck themselves into, but Eade’s Dogs couldn’t even offer that. Supporters were just left out on the cold, like they had been since 1954. As fans, often we most want a premiership not so much for catharsis, but simply for closure. We want to remember our favourite players as ones that went all the way. Bulldogs fans will think of the way Scott West threw himself into contests to extract the ball, the way Luke Darcy rose above them to grip it, and the way Brad Johnson cheekily grinned after goals, and there will be something missing. The lack of a full stop at the end of the memory. They never got to see them on the dais. So many teams have dynasties of ‘almost’. They build and build and then rise into the finals but never go all the way. They convince you that the year before was a building block for the year after, the year that finally the breaks will go your team’s way, and as a collective the players will discover the ethereal intangible that separates the champions from the very good. They make you believe that Nick Riewoldt’s tears of sorrow are just a preface to tears of joy, that Nat Fyfe’s yips in front of goal are only sewing the seeds for a full circle redemption story, and that the awkward of image of Nathan Buckley or Gary Ablett Sr. standing alone with a medal around their neck will soon be replaced by the more fulfilling one of them jumping up and down with 21 medal-bearing teammates. But, of course, it so rarely goes like that. In the AFL, on the purest level, you’re 94% assured of disappointment at the end of a season. Only one team is able to look back on a year with comforting finality – everyone else is building for the year after. Building and building. After more than half a century, the Bulldogs still didn’t have a home. The Dogs entered 2010 as a popular premiership fancy. They’d come so close in 2009, the closest they would come over that teasing three-year stretch, denied at the death by a Nick Riewoldt toe-poke at the tip of the goal square. They’d recruited Barry Hall in the off-season, their first commanding tall forward presence in years. The last weakness on the team had been addressed – there would be no more of this Mitch Hahn nonsense – and 2010 would be the year they’d finally break the drought. The other losing preliminary finalist from the year before, though, had also shored up its key weakness with a tall Sydney recruit. Collingwood had added ruckman Darren Jolly, and Jolly was instrumental in their run to the flag in 2010. The Magpies beat the favoured Bulldogs in round one that year by six goals at Etihad, the Bulldogs’ home, to set the tone for both of their seasons. They beat them again in the qualifying final, a 62-point hammering that flattered the Bulldogs. Being at the MCG that night, it was a loss that felt like a funeral. There was one moment in particular that painted the Bulldogs’ sad reality. With the margin already at fifty points and just minutes remaining, Alan Didak ran onto a Jarryd Blair pass in the left forward pocket, Tim Callan nipping at his heels. The ball bounced in front of Didak and he playfully tapped it to himself, turning Callan inside out and leaving him for dead the moment he gathered full control. He was in the wrong pocket for his left boot, pressed hard up against the boundary, so Didak made the token gesture of looking inboard. When there was no one on, he did what it seemed like he’d intended to do from the time he first saw the ball sail in his direction. Without ever breaking stride, he kicked a running left-footed check-side goal from close to the most impossible angle on the ground. Didak turned to the crowd with an expressionless face to smugly celebrate, using every ounce of energy in his body to try and maintain an indifferent exterior. Poor Tim Callan was left watching, his hands on his head, pondering the questions ‘how?’, ‘why?’, and ‘how?’ again. They beat them again in the qualifying final, a 62-point hammering that flattered the Bulldogs. Being at the MCG that night, it was a loss that felt like a funeral. The Bulldogs were always left watching, just like Callan. They were always a part of another team’s story, the unwitting subject to another team’s brilliance. The competition, the narrative, was never their own. The Dogs limped into another preliminary final that year and then fell to the Saints again, in a 24-point defeat that was never that close. The Bulldogs were tired, they were growing old, and their final six weeks of the season, which included comprehensive defeats at the hands of the three other teams they’d shared the top four with in 2009 and 2010 (the 101-point loss to Geelong especially galling), felt like a prelude to heavier pain to come. And come it did. But this time, for the first time, the rebuild would be different. The bottom fell out for the Bulldogs in 2011 and Eade was sacked mid-season. Brendan McCartney replaced him in 2012, spending three years at the helm and never finishing higher than 14th. Under McCartney, the Dogs commenced an old-fashioned tear it down and start again from scratch rebuild. There would be no Jason Akermanis shortcuts this time. The old guard was slowly phased out. Brad Johnson, who could barely walk by the end of it all, retired at the end of 2010, and Nathan Eagleton and Mitch Hahn followed suit. Barry Hall, Lindsay Gilbee, Ryan Hargrave and Daniels Cross and Giansiracusa all played their last games under McCartney. But these old stalwarts were quietly being replaced by young, future heroes. After the 2010 defeat to the Saints, for all intents and purposes the real end of the Rodney Eade era, the Dogs, for so long victims of poor choices and bad luck in the draft, started to reverse their fortunes. In the 2010 off-season they used father/son picks on Mitch Wallis and Tom Liberatore, two hard, in-and-under midfielders. They also went to the rookie draft and put two unheralded players with pace to burn on their list – their names were Luke Dahlhaus and Jason Johannisen. The following year they used their first round pick on goal-sneak Clay Smith, took a chance on mature-aged VFL player Tory Dickson in the third round, and picked up Lin Jong, Tom Campbell and Jack Redpath in the rookie draft. It was over 2012 and 2013, though, that the nucleus of the team that would change everything was formed. The Dogs had three top six picks across those two years – one as compensation for Callan Ward’s defection to GWS. In 2012 they used back-to-back picks on Jake Stringer, a mercurial forward who moved like a strange infusion of Didak and Cristiano Ronaldo, and Jackson Macrae, a silky left-footed midfielder. The next year, at pick four, they took a 17-year-old named Marcus Bontempelli. After years of missing on picks at the top of the draft, the most obvious area to find talent, the Dogs started finding key contributors in the unlikeliest of places. They drafted Lachlan Hunter in the third round of the 2012 draft, the same round they’d find Caleb Daniel in 2014. That year they also moved down two spots in the draft and added Shane Biggs from Sydney for their troubles before drafting Zaine Cordy in the fourth round. A team that couldn’t throw a rock into the ocean on draft night was now seeing its shots swish like Stephen Curry. But it was just before the 2014 draft that the most important event in 60 years took place for the Dogs. The Bulldogs rebuild had been happening quietly, in the shadows. They were off the national radar. Macrae, Liberatore and Bontempelli were exciting young players, but every rebuilding team at the bottom of the ladder had exciting young players. The Dogs won seven games in 2014 after winning eight, five and nine the previous three years. They were the definition of anonymous. All that was left was the stark reality that the football club was a black hole, devoid of success and optimism, and Griffen was escaping it. Who, really, could blame him? And then, an explosion. Ryan Griffen, the club captain, walked out on the team in early October, demanding a trade to GWS. Reports speculated that it was because of a rift with McCartney. 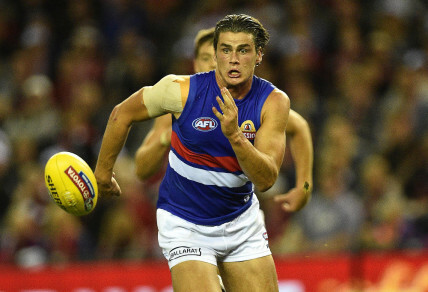 After much back and forth, the Griffen trade was made in return for Tom Boyd. Pick six was also included in the deal – going from the Bulldogs to GWS, which for some seemed like a typo at the time. The Bulldogs were ripped to shreds in the media and public over the whole affair. For Bulldogs supporters, it was a cruel blow, one that went beyond losing the team’s captain and best player. Griffen was a figure who gave the Dogs credibility – he was a reminder of a relevant past, some respite against the miserable present, and a bridge to a more hopeful future. Every time he burst along the wing, explosive and compact to the ground like a rugby player, and kicked inside 50 with that idiosyncratic motion of his, across his body, so right to left it was almost horizontal, the minds of Bulldogs fans drifted to better times that had been and, with any luck, better times that would come. When he walked out on the club, those illusions were shattered. All that was left was the stark reality that the football club was a black hole, devoid of success and optimism, and Griffen was escaping it. Who, really, could blame him? The dire situation was compounded with the signing of Boyd to a seven-year $6 million contract. Boyd was a player who had played nine games at the time. The Bulldogs had given up their captain and pick six in the draft for the right to invest their future in someone who was only theoretically good. In the middle of all this, McCartney resigned the day after Griffen made his trade demand. It was a debacle. The Bulldogs had no coach, no captain, no culture, nothing. They had Tom Boyd, who would hopefully be good four years down the track. At the time, it appeared to be a football catastrophe of historic proportions. In retrospect, it was just the clean canvas that Luke Beveridge needed to paint a masterpiece. A grand final is a snapshot in time. It’s a love letter from players to their fans, a record on vinyl to be played for years and years to come. For other fan bases, of course, it’s a horror film – A Nightmare on Punt Rd – to never be watched again. For the winner, there’s a sense of finality. It’s the only end of the journey there is, the only time you’re allowed to reflect on the road that brought you and see that detours were just detours, bumps were just bumps, and beyond the horizon, for so long something to chase through a thick mist of hope, there is actually, finally, a destination. Coaches and players so often talk about how the best time in football is the fifteen minutes after you win – before you have to redirect your focus, again, to the elusive ‘next’ thing. But some wins transcend that. Some wins stand for all of time. They’re so significant that they could never be viewed as a stop along the road – they’re a self-contained perfection. The Beveridge Bulldogs achieved that in their grand final. It was their first in 55 years, and there were enough memories within it to last another five and a half decades (although surely the football gods will not be so cruel to force Bulldog fans to have to solely rely on them for that long). So often when we think of players we think of their moments in grand finals. That’s what Bulldog fans were missing with their past favourites – and it’s what they now have for the rest of time with the 22 who took the field against the Swans. It starts with Bontempelli. It has to. There are so few players that stand taller than the game, who feel like they’re the ones directing its flow and not vice-versa. Patrick Dangerfield, Lance Franklin and Nat Fyfe all have that aura, and Bontempelli has it too. He’s a part of the game’s fabric, not someone placed arbitrarily on top of it. His beat matches every cadence, every breath of the game – and then he takes our breath away. Smooth yet powerful, graceful but brutal, ferocious and sumptuously skilled … Bontempelli will be forcing writers to delve into the thesaurus for new adjectives to try and capture his profound brilliance for years and years – the same amount of time we’ll be replaying THAT grand final shimmy in our minds. It starts with Bontempelli. It has to. There are so few players that stand taller than the game, who feel like they’re the ones directing its flow and not vice-versa. The Bulldogs have developed in Bontempelli’s image – they play with hardness and power, but also with his fleetness of mind. The toughness is self-evident – they’re second to none at the contest, which the bloodied Bloods can attest to. The grace is inevitably more esoteric, but it’s found time and time again in those deft, improbably quick handballs. There was a time in the grand final’s first half where it began to feel like the Bulldogs should just handball every ball over their head without looking – it’s not like they were ever going to miss. It’s a skill not as viscerally obvious or inspiring as Hawthorn’s kicking or the way Mark Thompson’s Geelong moved the ball through the corridor, but in a way the Bulldogs’ in-close hands are just as impressive. They bludgeon you with their brute force, and then they delicately slip the knife in with a surgeon’s handball. They give you multiple ways to die – always the mark of a great team. Liberatore, Hunter and Dahlhaus were experts at in close extraction against Sydney. On the outside, Macrae and Daniel joined with Bontempelli to add polish by foot, caressing the ball to targets. It was a collective performance where everyone played their part. Liam Picken, perhaps the Bulldogs’ best player in the finals, was brilliant, tormenting the Swans with three goals – a fitting nod to Beveridge’s genius, its most obvious masterstroke shifting Picken from tagger to dangerous forward. Released from the responsibility of quelling the brilliance of other players, Picken was liberated to create his own, and that’s exactly what he did. You knew that strange things were happening with the Bulldogs when Liam Picken started confusing himself with Wayne Carey, regularly plucking contested marks in the finals. The team’s most virtuoso talent, Jake Stringer, lowered his colours on the day. It was a performance so poor, Stringer so clearly stuck in his own head, that the commentators were saying that he needed to lift to the point of having ‘just’ a bad game, and not the ‘really bad one’ he was in the middle of. The turning point came, only for one moment – but what a pivotal moment it was. Stringer’s deputy, in flash if not output, Tory Dickson, was much more consistent. A finals series is an odyssey, and so it was for Dickson. He was overwhelmed by the occasion against the Hawks in the semi-final, his sharp eye for goal, his calling card as a player, developing blurred vision at the worst of times. He missed his first three shots at goal that Friday night, all shots he would have been expected to convert. It looked, for a time, like he’d cost the Bulldogs their season. But his teammates picked him up, and against the Swans he paid them back. This time, his first three shots were all goals. Jason Johannisen had a strange game, an odd mix of accumulation, attacking drive and more than a few kicks that he would have liked back. It was a memorable performance, for better and sometimes worse, and was rewarded with the Norm Smith medal. 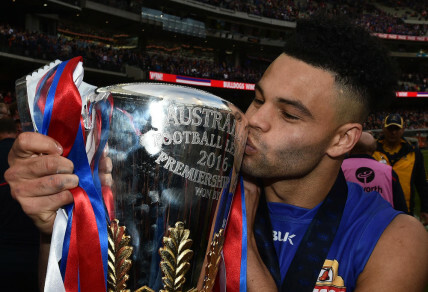 The enduring memory of Johannisen’s finals series, though, will surely be from a week earlier – when he burst out of GWS’s 50 in the final term with a pace as implausible as it was breathtaking (it seemed like the ground was ice and he had skates on and the other 35 men on the field were wearing gumboots) and delivered the ball into Bontempelli’s path for a game-breaking goal. Matthew Boyd, the veteran marshal of a young defence, was calm all day, leading the way and finding targets by foot when his more youthfully exuberant teammates lacked cleanness early on. Bulldogs fans rarely had a moment to take a deep breath, except on the occasions when Boyd found the ball in space in defensive 50 – there was a special confidence that he’d do the right thing with it. At the other end, that confidence was in Clay Smith, an unlikely finals hero. It speaks volumes about the enormity of the Bulldogs’ story that Smith, a 23-year-old who has gone under three knee reconstructions and dealt with the death of a close friend during the finals series, might not make it into the top 10. But he was vital for the Dogs, and without him they wouldn’t have won the flag. It was his composure against the Hawks to slot two crucial goals just before half time with ice water in his veins when his teammates were running too hot that changed the game. And it was his everything that took down the Giants, booting four first half goals to give his team the advantage. He kicked eight goals, one behind for the finals series, which seems improbable – I can’t remember him ever missing. 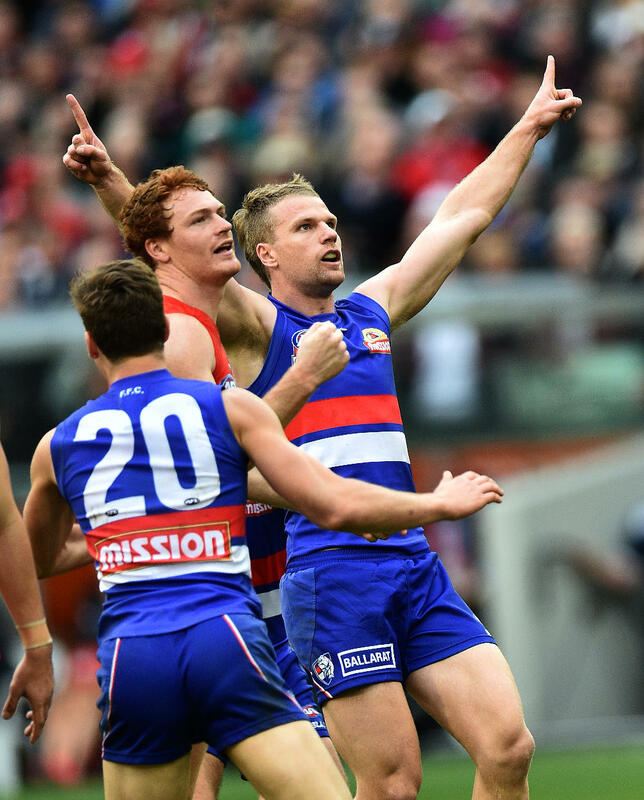 Jake Stringer of the Bulldogs of the Western Bulldogs reacts after kicking a goal during the AFL Grand Final between the Sydney Swans and the Western Bulldogs at the MCG in Melbourne, Saturday, Oct. 1, 2016. Across the ground, everyone filled their role. Jordan Roughead was imposing in the ruck, playing without any sense of fear, propelled by the moment as he had been all finals series. Easton Wood was equally fearless in defence, showing a leader’s desperation, reading the play, crashing packs and sending the ball forward as often with his fist as he did with his foot. He looks like Clark Kent and leaps like him too. Dale Morris was heroic, winning one-on-ones and playing with a composed ferocity, as though the euphoria of victory was going to be the only way to forget about the pain of the two broken vertebrae in his back. Joel Hamling was his equal on the day, somehow quieting Lance Franklin, and often it felt like those two grand finals where Nathan Brown got the best of Nick Riewoldt. The Beveridge era was born with the trade for Boyd, so it was only fitting that Boyd kicked the goal that would serve as its exclamation mark. Its first true catharsis. As Boyd unleashed that kick from well beyond 50 and the ball took that strange bounce and hovered in the air, Dennis Cometti, in one of his final calls, said that the stadium was holding its breath. He’d understated things. A country was holding its breath. 62 years was holding its breath. And then, finally, we all exhaled. The weight of history is a burden heavy enough to sink most teams. When a team has all that expectation it can wilt under it. The 2010 Magpies, bearing the hopes and scars of two decades of losing suffered by the country’s biggest fan base, melted in the grand final against an inferior team. The drain of favouritism combined with expectation was too much. Only a bounce, also to the right, was enough to save them. The 2013 Dockers, carrying a history defined by so many Ls and so few Ws, also cracked on the big stage. Fear manifests itself in different ways. The Dockers weren’t timid that day – their problem was that they probably could have used a bit more timidity. Composure abandoned them – they attacked the ball almost too fiercely, like it was a grenade to throw into the jungle and not something they needed to caress through two tall sticks. Hayden Ballantyne is still running after Hawthorn players like they offended his family’s honour, instead of just trying to get the ball off them. The Bulldogs, though, were somehow liberated by history. Not only that, but it seemed to spur them on. No team, perhaps ever, has dealt with the pressure that they dealt with on grand final day. Not only did they have 62 years of misery to overcome, they also had the entire country wanting, NEEDING, them to win. They had so many excuses, so many potential moments where they could have taken an exit ramp, so many times where they could have given in and nobody would thought less of them, but they just kept on enduring. They just kept on enduring. There were four times where it felt like it was over. The first came just minutes into their opening final. The journey looked over before it had even begun. The Eagles were the form team of the competition, playing at home against a team that had just lost to Fremantle the round before at the same venue – failing to score even 50 points against the woeful Dockers. West Coast kicked the first two goals of the game, both from nervous Bulldog turnovers. The Dogs looked rattled. This was going to be a bloodbath. And it was. The Dogs picked up the rattle and beat the Eagles to death with it. They were an avalanche of awesome pressure, an avalanche that Jack Darling is still buried underneath. They played with such power, such speed, such force, such belief that night that it felt like they were capable of something special. Their reward for such a performance, though, was a date with maybe the greatest team of all time. The Bulldogs came out fired up against the Hawks, but their opponents, as they so often do, sat back, let the fire extinguish, and then skated right past them. They led the Dogs 46-25 in the second term and Luke Breust had the chance to extend the lead to something that felt out of reach. He missed. Then Bontempelli happened, and four in four years gave way to the possibility of one in 62. It really did feel over, though, in the final quarter against the Giants. After getting the jump on them in the first quarter but failing to capitalise, the Dogs had spent the rest of the game merely holding on. The Giants felt in control – they played faster and they played cleaner. 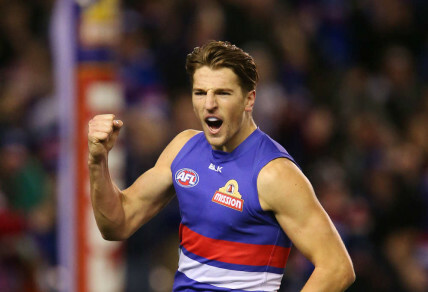 They had man mountains Jonathan Patton, Rory Lobb and Jeremy Cameron up one end – the Dogs had 181cm of Clay Smith and a bloke named Tory up the other. When the Giants went up 74-60 at the start of last term it felt like the Bulldogs dam wasn’t just breaking, but that it may have already broken. It had been so hard for them to score all game, and it seemed unlikely that they’d be able to manage two more goals, let alone the three needed to take the lead. They kicked four. And then there was the grand final. Mid-way through the second quarter, it looked like the Bulldogs might run away with it. Towards the end of it, though, the Swans had overtaken them and were escaping to the edge of the Bulldogs’ sight. Josh Kennedy’s imposing frame was everywhere, a force so powerful that he looked like he could extend the Bulldogs’ misery into a 63rd year all by himself. But the Dogs hung on, they never tapped out, and then Toby McLean kicked a vital goal in the final breath of the first half to take them to the break with restored life. They took that life into the second half and then they lived like they never had before. This was the impossible premiership. None of it made sense; none of it ever made sense. The beauty of sport is that it’s on our screens without a script. But what made these Bulldogs so special is that it did feel like their lines were written in advance – that was the only plausible explanation. They weren’t just a team of destiny – they were a product of determinism. But that same determinism, which conspired to bring so much heartache to this club for more than half a century, put on the wrong shoes this spring. What resulted was the best film that Australian football has ever seen. The Bulldogs were underdogs in the purest sense of storytelling. They went to stranger territories twice and toppled two villains – the Eagles, wealthy products of persistent success, a team that coasted through much of this season, never extracting the most out of their talent, and the Giants, football’s equivalent of the 16-year-old private school boy with slicked back hair, the CEO father and the world handed to him on a platter. In between they ended the Hawks’ premiership dynasty, a necessary passing of the torch that the script called for. And then finally they beat the Swans, because it had to be the Swans. Hope for this Bulldogs team was first born last year in Sydney in round five, when they toppled the six-goal favourite Swans in the wet. That was the game where it all became possible. And then, twenty months later against the same favoured opponent, the hope of possibility gave way to the ecstasy of reality. On the streets of Melbourne, you could feel the story’s arc building across the finals. You’d sit on the tram, innocently eavesdrop on the conversations of strangers and hear them say singular buzzwords: ‘Bontempelli’. ‘Stringer’. You’d go into work on Monday morning and see Bulldog scarves and beanies, attire that was typically destined only for the weekend. You’d talk about the football with people who generally only paid the game fleeting attention and they’d ask you whether the Dogs were going to win the grand final. You told them no, that you thought the fairytale was just simply getting to the game, and the more talented, experienced team would triumph when push came to shove. They’d tell you that they weren’t so sure about that and that the Dogs might just get up. After the fact, you realised you were speaking logically about a topic that had become so wonderfully illogical. They were right, you were wrong, and thank God for that. This Bulldogs team transcended the AFL. They transcended sport. They came to symbolise something greater – something about resilience, about community, and more than anything, about hope. They made you want to re-watch ‘The Shawshank Redemption’ and cheer when Andy tells Red that ‘hope is a good thing, maybe the best of things, and no good thing ever dies’, because 22 blokes you’d never met had just proven those words to be true. The beat will go on for the Bulldogs. It felt like only minutes after the grand final that Luke Beveridge was already talking about next year, about footballisms like sustained excellence. He has to – it’s his nature, filled with the same rich integrity and stoicism of Bill Belichick and Gregg Popovich (but in a way that’s somehow likeable), a nature that makes him so endearing and commanding of respect. The Bulldogs have every chance to be a dynasty. They’re a young team that just won a premiership the same year they won their first final, and they won it without the likes of Matt Suckling, Marcus Adams, Mitch Wallis, Jack Redpath, Stewart Crameri and, of course, Bob Murphy, all quality players who add depth to one of the already deepest teams in the league. Travis Cloke will be on board next year too, and while all earthly indications say that he’s finished, if anyone is going to trigger his renaissance it will be Luke Beveridge, for whom earthly considerations carry very little weight. They already have their mission too – this year they won the premiership for Bob Murphy, next year they’ll look to win it with him. Murphy means as much to the Bulldogs as any player means to any team, something that became clear if it wasn’t already when Beveridge nobly invited him onto the dais, the cresting moment of this incredible story. But that’s for then, and if ever there was a time to pause and be content with now, it’s for these Dogs. Their victory, their story, stands taller than the AFL cycle. No matter what happens next, they will always have 2016. It’s untouchable. It was 62 years in the making and it will be longer than that before it’s forgotten. Image Credit: All images are Copyright AAP Australia.